Queen of Femininity: Miss America ~ The History Girl! Many traditions have changed during the history of the Miss America pageant which began at the dawn of the Roaring Twenties and continues today. In 1920, a member of the Business Men’s League of Atlantic City proposed a “Fall Frolic” to be held in late September. After Labor Day, business slowed down and something was needed to boost off-season tourism. The frolic didn’t happen but the International Rolling Chair Pageant held in 1920 was a big success. Then someone came up with the idea to add a beauty contest to the parade. During that same year, women achieved suffrage and Prohibition went into effect. Women’s fashions were changing. Bathing suits were more revealing, some even showing bare knees! East coast newspapers sponsored contests for readers to nominate contestants. 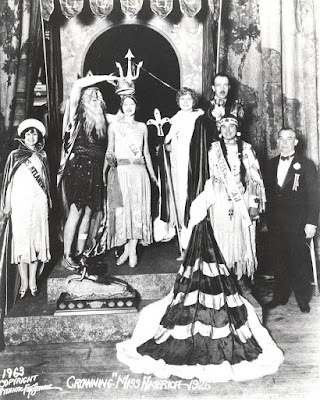 The young women entered in the first Miss America event in September 1921 represented cities, not states, in an Inter-City pageant (the pageant gradually transitioned to having women representing states). Some of the contestants were Miss Camden; Miss Harrisburg; Miss Newark; Miss Philadelphia; Miss Washington, DC; Miss Ocean City; and Miss Atlantic City. The young women appeared in a Rolling Chair Parade wearing elaborate costumes and a Bather’s Review, in swimsuits. A highlight of the event was the arrival of “King Neptune,” who floated onto the beach in a large shell with a bevy of sea nymphs during a spectacular entrance. The surprise winner, known as the “first Miss America,” was a petite sixteen-year-old named Margaret Gorman who represented Washington, DC. 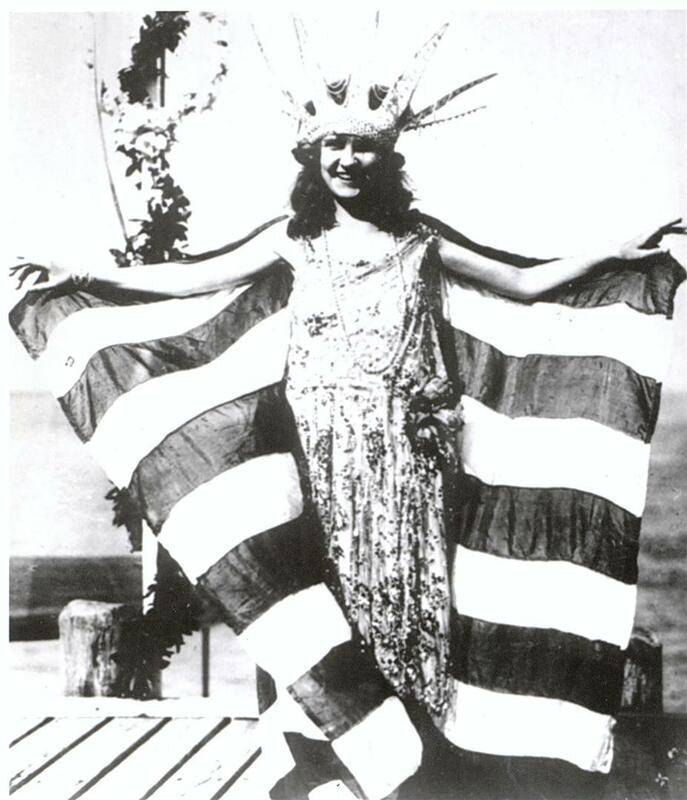 An iconic photo of the first Miss America, sixteen-year-old Margaret Gorman, Atlantic City, 1921. Atlantic City Free Public Library. For the next few years, the September beauty contest expanded and drew big crowds. Nevertheless, it was discontinued from 1929 to 1933 due to financial difficulties and allegedly because some critics thought the event was encouraging immoral behavior. In 1932, a “Miss America” pageant was held at Wildwood but it was not officially sanctioned by the organizers of the Atlantic City event. The winner was Dorothy Hann, who was known as “Miss America 1932.” The Atlantic City pageant started again in 1933 and was very popular during the 1940s and 1950s. It was first televised nationally in 1954. Brains and not merely beauty became important, and finalists had to answer questions about social problems and current events. Many of the women were admired for their accomplishments in non-traditional female roles, especially those pursuing careers in math and science. The 1937 winner, Bette Cooper, was one of only two Miss New Jersey entrants ever to win the official title of Miss America. She was known as the beauty queen who disappeared. Bette, Miss Bertrand Island, ran off with her male chaperone, possibly in a motor boat, shortly after she was crowned. Even after she was located, she never carried out her term as Miss America. No one replaced her, and she dropped out of the public eye. In 2014, she was reportedly alive and living a quiet life in Connecticut. She has refused to ever give any interviews. Perhaps the most bizarre story about a Miss America contestant is that of Janice Hansen, Miss New Jersey of 1944. She did not win the crown but achieved notoriety some years later. Janice was suspected of being involved with organized crime bosses and was questioned by law officials. She supposedly had dinner with mobster Albert Anastasia in 1957 on the night before he was murdered. In 1959, former beauty queen Hansen and Anthony “Little Augie” Pisano were shot and killed while sitting in a car in Queens, New York. There are many interesting “firsts” in the history of the Miss America pageant. The first Native American (Cherokee) to win the title was Norma Smallwood, Miss Tulsa, in 1926. Miss America 1926. In Atlantic City, King Neptune crowns the winner, Norma Smallwood, who was Miss Tulsa. The Oklahoman was the first Native American to be Miss America. On the right is Native American Alice Garry, who appeared in the pageant as "Princess America." The Golden Mermaid, a trophy presented to winners of early pageants, is near the foreground. Atlantic City Free Public Library. 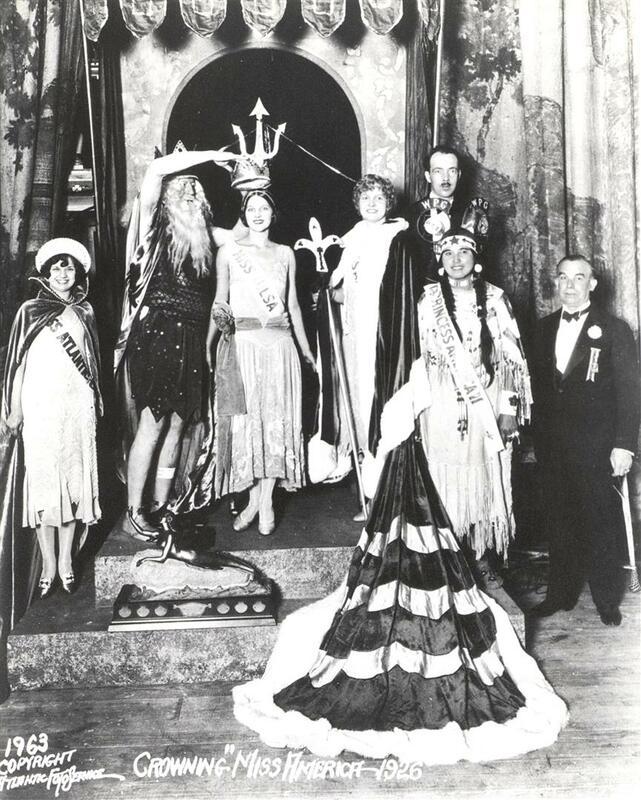 In 1935, the pioneering Executive Director of the event, Lenora Slaughter, established the first talent competition of the pageant. The first scholarship grant awarded went to Bess Myerson, Miss America 1945, who was the first Jewish woman to win and the first college graduate selected. In 1970, Cheryl Brown became the first African American woman to compete in the event. Miss America of 1994, Heather Whitestone, who is “profoundly deaf,” became the first woman with a disability to win the title. The 2014 Miss America, Nina Davuluri, was the first winner of Indian American descent. By 1995, more than $100 million in educational grants had been awarded, making the organization the world’s largest provider of scholarships exclusively for women. 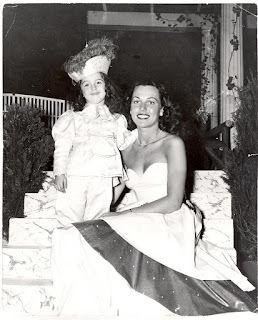 Bess Myerson, Miss America 1945, with Vicki Gold as her young page. Photo by Al Gold; Vicki Gold Levi collection. Miss America has survived as a positive role model for several generations of fans, but the pageant has had its share of controversies. The second wave of the women’s movement and civil rights issues heated up in the 1960s. Miss America needed to change with the times. Protests took place, and the pageant became a target of ridicule and, for some, a symbol of bigotry. In response, the Miss America organization adopted new policies and worked to improve the image of the contest. At the 1984 pageant, Vanessa Williams, Miss New York, made history as the first African American woman to win Miss America. A scandal developed during her reign because she had posed for photos that were published in Penthouse. She resigned, and first runner-up Suzette Charles, Miss New Jersey, took over for the remainder of the year as Miss America. Charles, from Mays Landing, became the second Miss New Jersey to be crowned and the second African American to hold the title. Both Williams and Charles went on to successful careers in the entertainment business. It was a bitter blow to Atlantic City when the Miss America pageant moved to Las Vegas in 2006. But in 2013, the event returned to the New Jersey resort city which had hosted it since 1921. Boardwalk Hall, known as Convention Hall when it became the site of the pageant in 1940, was the main venue for the event once again. Numerous books, articles, and television documentaries have illustrated the history of the Miss America competition. The organization’s official website, www.missamerica.org, provides information about the pageant, its mission, and biographies of the winners year by year. The Atlantic City Historical Museum features displays of Miss America memorabilia. Recently, the museum acquired one of the whimsical shoes worn in the Show Me Your Shoes parade by Miss Delaware 2014, Brittany Lewis, who hails from Brigantine New Jersey. Miss America and other beauty pageants have played a big role in the social and economic history of the New Jersey Shore. Many of the winners and contestants are indeed remarkable. This year, the pageant will be held on September 13, 2015, at Atlantic City’s Boardwalk Hall which was designated a U.S. National Landmark in 1987. Previously known as Convention Hall, it first opened in 1929. The arena is the site of sporting events, concerts, and exhibitions, and its gigantic pipe organ has recently been restored. Perhaps the most talked about year in the hall’s history was 1964 when the Democratic National Convention was held there, and Lyndon B. Johnson was nominated for President (nine months after the assassination of President Kennedy). Soon after that, on August 30, 1964, the Beatles’ concert at Convention Hall thrilled frenzied fans during the “mop-headed” group’s first U.S. tour. An illustration of "The World's Most Famous Auditorium" from a 1928 booklet. Before it officially opened in 1929, brochures began promoting The Convention Hall (now known as Boardwalk Hall) which was designed by Lockwood, Greene & Company Inc. of Boston. The enormous facility between Georgia and Mississippi Avenues was built by the City at a cost of $ 10,000,000. Convention Hall promoters claimed it could seat "the entire permanent population of Atlantic City - 66,000 - and still leave room to spare!" The Miss America Pageant was the main event here from the 1940s through 2004 (when the pageant moved to Las Vegas) and from 2013 (when it returned to Atlantic City) to the present day. Author's collection from her book, "The Roaring 20s at the Jersey Shore" (Schiffer, 2009). Kira Kazantsev, Miss America 2015 (the third Miss New York to win in the past three years), will relinquish her crown to a new “queen of femininity.” The current Miss New Jersey, Lindsay Giannini of Hammonton, is one of the fifty-two hopefuls (representing the fifty states plus The District of Columbia and Puerto Rico) competing for the 2016 title. History is everywhere along the New Jersey Shore, from the lighthouses that dot the coast to the Victorian grandeur of Cape May. Less visible are the stories of the women who helped shape that past. Trailblazing young women in Belmar and Wildwood became lifeguards, proving that women were just as capable as men. Cindy Zipf has worked tirelessly for more than thirty years to stop ocean pollution and protect marine life. Theatrical stars, pioneering politicians, a Titanic survivor and a cosmetics entrepreneur all called the Jersey Shore home. Even several first ladies vacationed in towns along the coast. 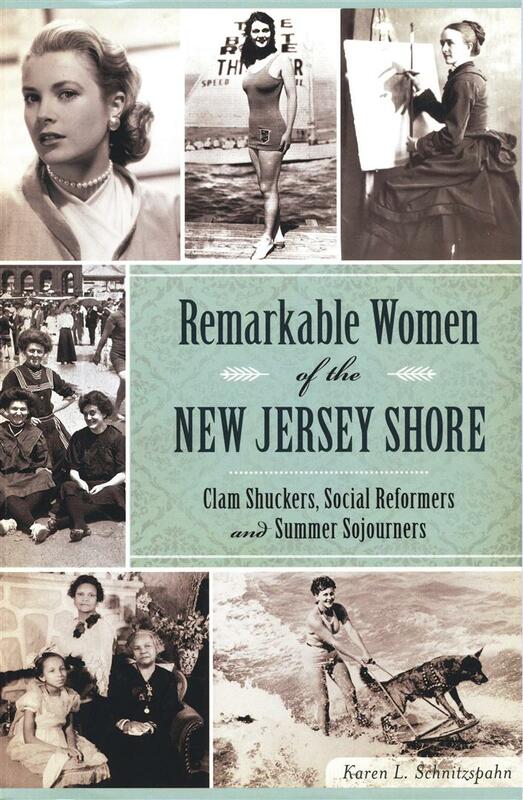 While countless women have contributed to the region's past, local author Karen L. Schnitzspahn chronicles some of the most intriguing stories of the remarkable women of the Jersey Shore. No trip to the Jersey Shore would be complete without indulging in the cuisine that helps make it famous. These foods we enjoy today are part of a long tradition beginning in the Victorian era, when big oceanfront hotels served elaborate meals. Diverse dishes and restaurants emerged during prohibition and the Great Depression, when fast food appeared and iconic boardwalk treats developed. Predating the farm to table movement, fancy and fast eateries have been supplied by local fishermen and farmers for decades. So whether you indulge in a tomato pie, pork roll or salt water taffy, take a mouthwatering historical tour and discover timeless treats from Sandy Hook to Cape May. For over twenty-five years, Karen L. Schnitzspahn has been writing and researching about the history of the New Jersey Shore where she lives. 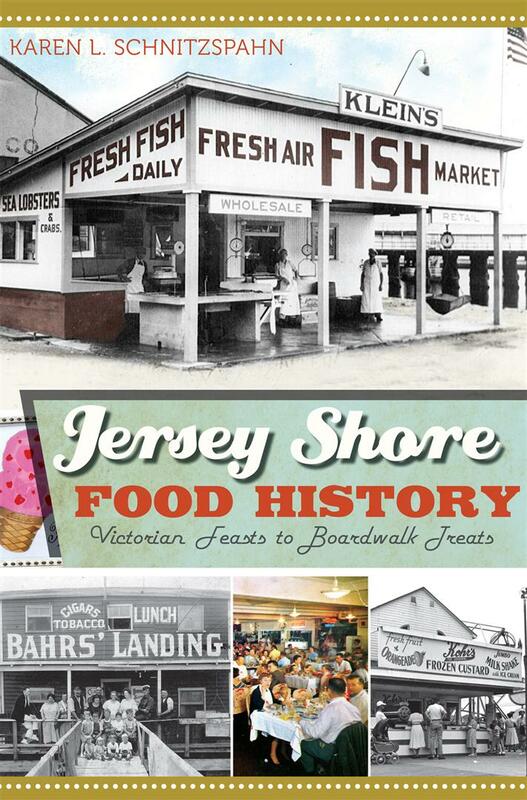 Born in New Brunswick, New Jersey, she is proud to be a “Jersey girl.” Karen is the author or co-author of ten regional New Jersey books including Jersey Shore Food History: Victorian Feasts to Boardwalk Treats (The History Press, 2012) and Remarkable Women of the New Jersey Shore (The History Press February 9, 2015). She’s been the recipient of awards such as the 2007 Jane G. Clayton Award for “her outstanding efforts to preserve the history of Monmouth County.” Her varied interests include the history of the American theater and the art of puppetry. For many years, Karen worked as a professional puppeteer and designed educational children’s programs. You can also visit Karen's web site, www.karenlschnitzspahn.com.